The Oklahoma City Thunder beat the New York Knicks last night in the Chesapeake Energy Area in front of another sellout crowd (18,203). The home fans were treated to Russell Westbrook’s twenty-seventh triple double (38-14-11). Another buzz of the night was the introduction of former Thunder Kendrick Perkins by the in-house public address announcer Mario Nanni. Perkins, unlike the negative response by the Thunder crowd last Saturday night with the first sighting of Kevin Durant in OKC since his departure last summer, was given a standing ovation. Along with his wife Vanity, a subcultural personality herself in this city, Perkins is now a beloved in this franchise on Reno Street, and the now free-agent is deserving of that feeling from the fans of the Thunder. 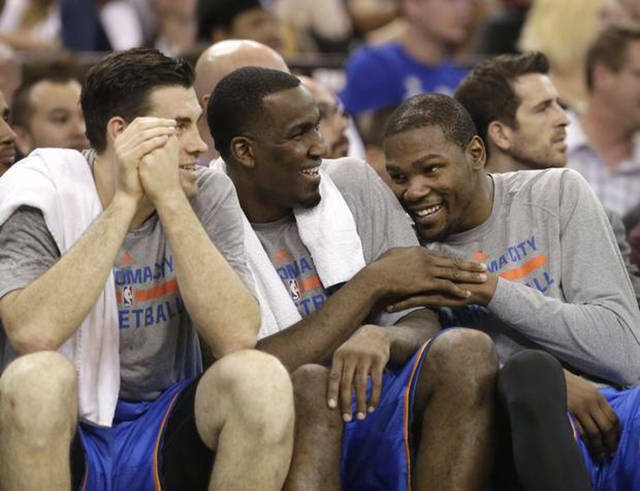 As Perkins was a welcomed guest in a practice before the game at the training site of the Thunder, Perkins transcends the various teams he has played for and is a positive influence in the NBA. When Kendrick Perkins was traded to the Thunder a complete culture change took place as the team went from an extremely talented but inexperienced and “soft’ team to one of the most highly competitive, with “swagger”, starting five’s in the Association. Every team has to have the man that sets the mental attitude of the team and Perkins was the man in OKC. His presence, having won a ring with Boston, set the stage for the immature Westbrook, the beta-male in Durant, and the rookie Harden to get a sense of stature while developing into the best young team the NBA had seen in twenty years. 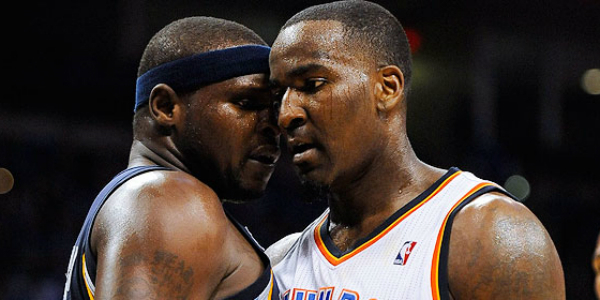 Perkins, along with Thabo Sefolosha to a lessor degree, gave the team what it needed, a hard edge on the court. Perkins, never noted in OKC for his scoring offense, was a monster in his first three years on defense, understanding the role of a post defender against the best that the Association could throw at him and his teammates. And yes, he could set a strong pick to free up Kevin or Russell, or James. Dwight Howard, for example, was always held in check when Perkins was his foil. Zach Randolph, the fine big from Memphis, was effective, but not as much as he would have liked going against a Perkins led OKC interior defense. The fact of the matter, Perkins, a player that jumped like a fat white man, was so skilled in his post defense, was always a positive even with a lack of other qualities of an NBA player. 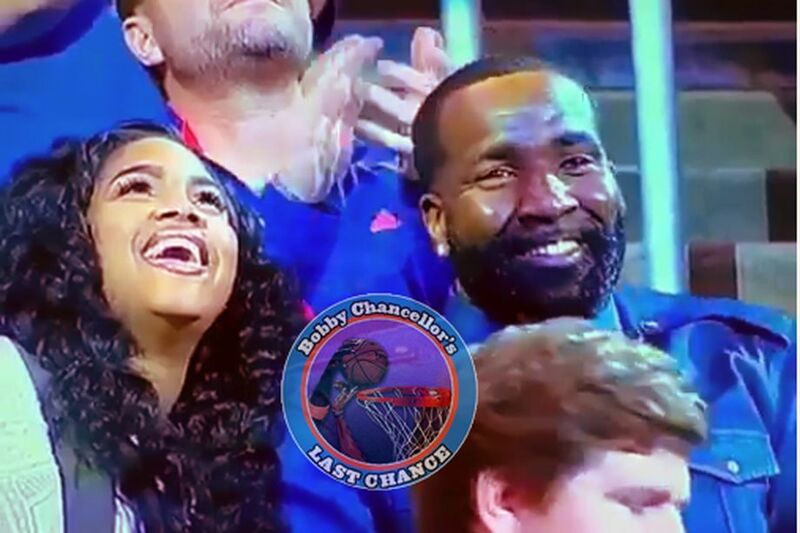 One day, probably sooner than later, Kendrick Perkins will be an assistant coach on an NBA team. His knowledge and teaching ability of post play will guarantee that. It should be noted that Perkins is still a media darling, in that when he speaks, his words are put into print. Perkins is an interesting personality in the league. His relationships with both players and NBA general managers is positive. He will be a natural in the coaching profession. He knows basketball sports fans.